Arching sprays of bold, tomato-red, funnel-shaped flowers appear in August and September among handsome, pleated, mid-green leaves. This vibrant bulbous perennial is perfect for a mixed or herbaceous border in a sunny, sheltered site or as part of a 'hot' colour scheme. 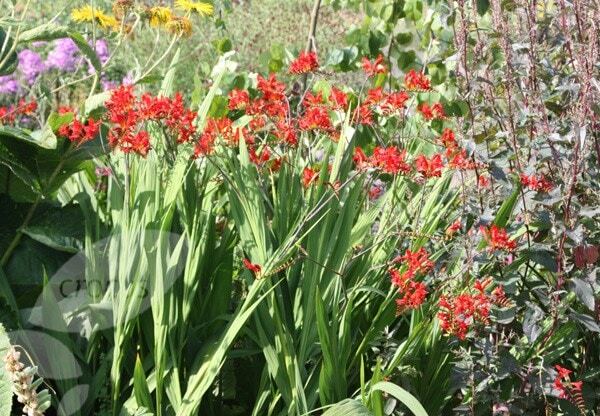 For maximum impact plant in bold drifts in a sunny, sheltered site with moderately fertile, humus-rich, well-drained soil. They make excellenllent cut-flowers. Garden care: Resist removing the faded foliage in autumn and cover the crown of the plant with bracken or bark chips to protect the plant against frost damage. 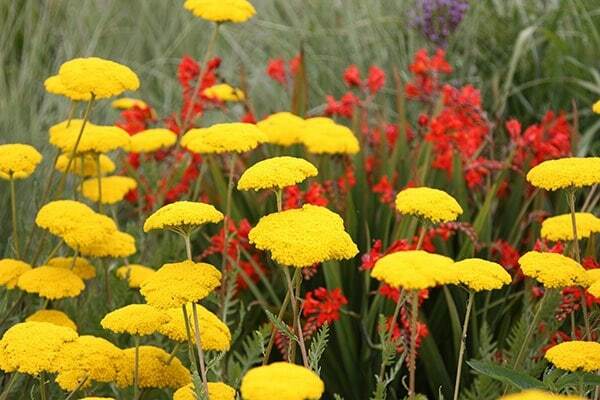 Lift and divide congested colonies in spring, planting the divided sections 8-10cm (3-4in) deep. Was a good healthy plant on arrival. A lot bigger than i expected. Just as expected really pleased nice healthy plants beautiful colour. My plants arrived when they said they would and we're in very good condition. on arrival, the plants were massive! 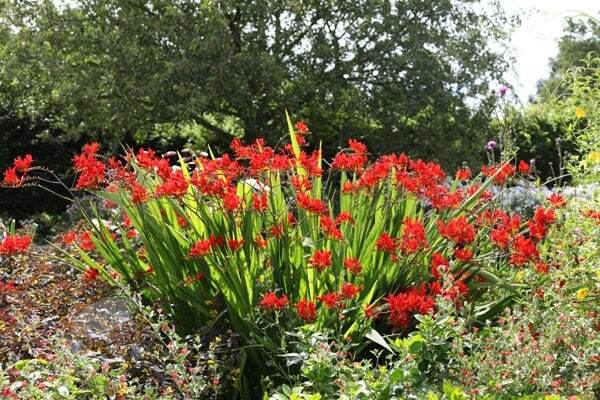 I was keen to find this plant, saw it demonstrated on "love your garden". Magnificent colour, excited about it coming back this year as they die off in the winter. It arrived in flower and in wonderful condition. 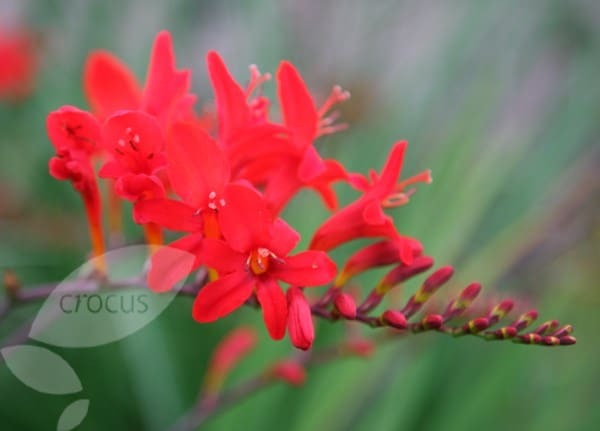 Vibrant red crocosmia. No problems with pest or diseases. Can look a bit sparse in first year but formed a clump by the second year. Growing happily despite very poor and stony soil. Easy to maintain. Beautiful flowers. 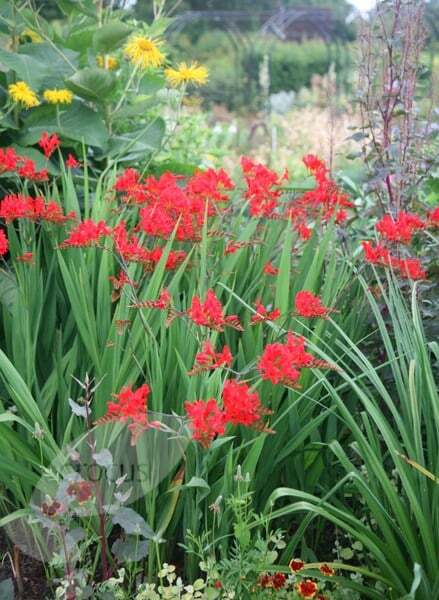 I have two clumps of 'Lucifer' at the back of a mixed West facing border. They've been in there for about five years and every year both clumps flop over the plants in front and hang over the lawn. This doesn't do the other plants or the lawn much good. I thought Lucifer didn't need support, so what could be the problem? Hello, Provided the clumps are not too congested - and they get a good amount of sun, then they usually do not need staking, however they can get floppy if they are stretching for the light. Hello, It is definitely not too late to plant this now, but how big (high) it will be will be changing on a weekly basis at this time of the year. That's because they die down to below ground level each year, and at this time it is currently growing at a rate of knots! Hi purchased this about a month ago . Leaves are yellowing and looking a bit sickly . Red flowers now look like small green berries . Advice would be appreciated. I am a novice gardener . Hello, These are starting to fade now, so what you are seeing is pretty typical for the plant. After the flowers die off, the plant produces its seedheads, which initially resemble a row of peas before they ripen. As for the foliage, it will continue to deteriorate throughout the autumn and dieback altogether in winter before re-emerging again in spring. 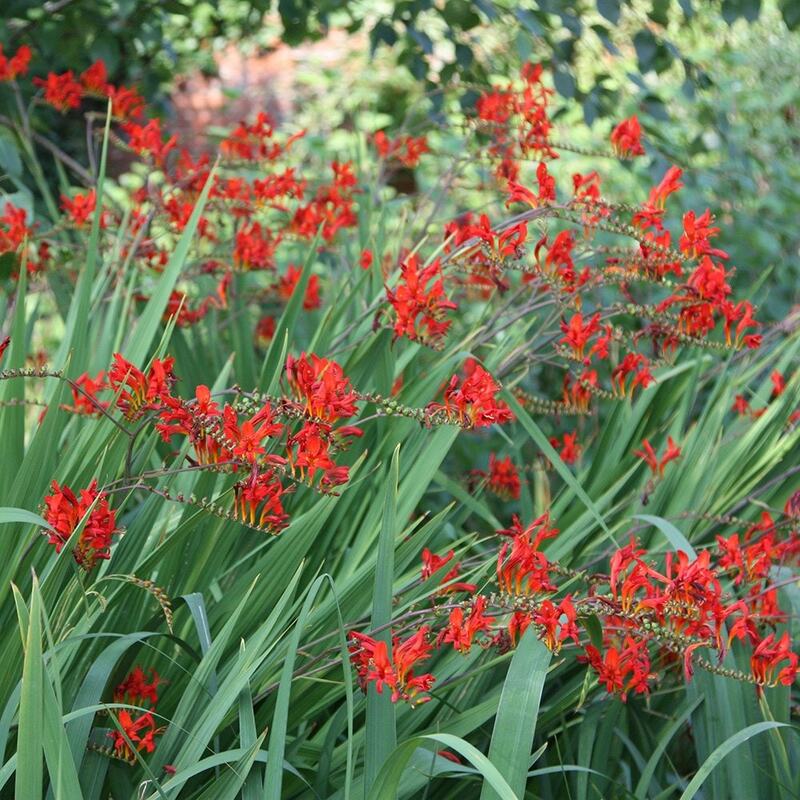 I have a clump of crocosmia which has been established for about 4 years. It has only flowered in the last 2 of those years and many of the stems are "blind". Should I remove the corms which have no flowers this year? Hello, There are a number of reasons why plants don't flower, but given time and the right conditions, there is no reason why they wont. I suspect they may not be getting enough sun, so it may be worth lifting them and moving them to a sunnier spot. You can also often give them a bit of a push by feeding during the growing season with a high potash fertiliser.